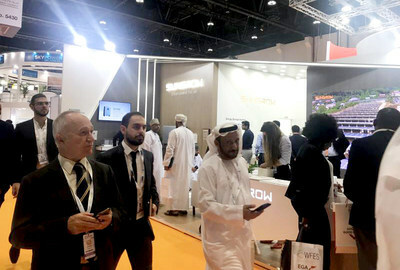 ABU DHABI, UAE, Jan. 15, 2019 /PRNewswire/ -- Sungrow, the global leading inverter supplier for renewables, has presented its upgraded C&I and utility-scale PV and energy storage solutions at World Future Energy Summit (WFES) 2019 in United Arab Emirates. Typically for the Middle East and North Africa (MENA) market, these product solutions can lead to a considerable lower LCOE. Optimized for large-scale 1500V flat ground plants, Sungrow unveiled its newest 1500V turnkey central inverter solution SG3850HV-MV, which features an easy integration of the 3.85 MW central inverter, transformer and medium voltage switchgear. The product is available for a containerized pre-integrated design, and enables the IP65 overall protection and C5 anti-corrosion, which is resilient to harsh conditions in MENA . It also characterizes a DC/AC ratio up to 1.8 and enables a maximum inverter efficiency of 99%, significantly ensuring high yield. Another model from string product series is the SG110KTL-M, which focuses on C&I solar plants. Equipped with 9 MPPT, fuse-free for better O&M, and easy APP commissioning, the 110 kW string inverter is adaptable to sophisticated installations. Energy Storage Solutions were also showcased, with the DC-coupled 4MW/2MWh turnkey solution highlighted, a product specifically designed for utility-scale storage projects in MENA. It features the integration of energy storage converters, lithium-ion battery banks and advanced battery management systems. The fully integrated package is aimed to simplify deployment with low O&M costs, high performance and maximized system efficiency. Solar demand in the Middle East and North African market has grown over 170%, according to recent market studies. Sungrow in particular has witnessed significant achievements in the region. In 2018, the company opened its Dubai office to expand its commitment to this vibrant region for clean energy. Additionally, a 142 MW project in Egypt has been commissioned successfully as of December 2018. "MENA is one of the most dynamic and fast-growing solar market in the world. Sungrow is ready to become a leading player in this market and will continue to provide unmatched innovative solutions for local customers and partners," said Jack Gu, President of Sungrow PV & Energy Storage Division. For further inquiries, please contact Sungrow Dubai subsidiary at mena@sungrow.co. Sungrow Power Supply Co., Ltd ("Sungrow") is a global leading inverter solution supplier for renewables with over 79 GW installed worldwide as of Dec 2018. Founded in 1997 by University Professor Cao Renxian, Sungrow is a leader in the research and development of solar inverters, with the largest dedicated R&D team in the industry and a broad product portfolio offering PV inverter solutions and energy storage systems for utility-scale, commercial, and residential applications, as well as internationally recognized floating PV plant solutions. With a strong 22-year track record in the PV space, Sungrow products power installations in over 60 countries, maintaining a worldwide market share of over 15%. Learn more about Sungrow by visiting www.sungrowpower.com.